Tomorrow we celebrate one of the most solemn national public holidays, Anzac Day. A day of remembrance dedicated to all those who fought (and those who fell) and their families. 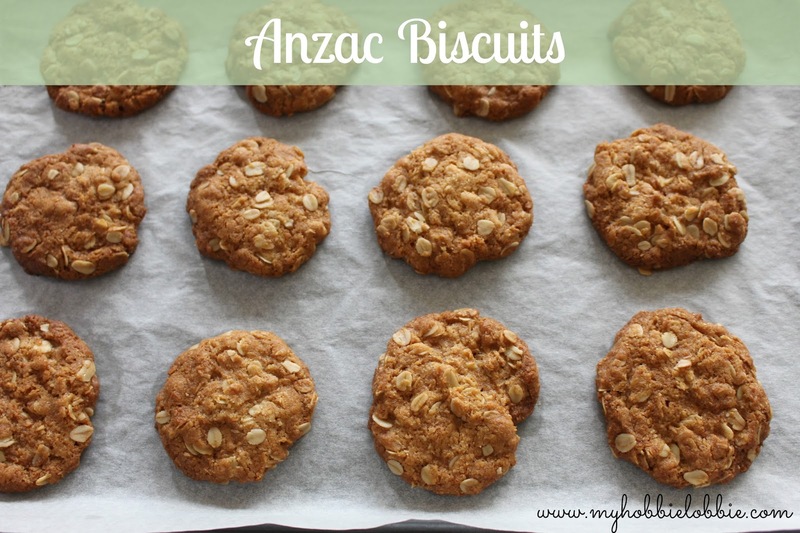 It seemed fitting to make some Anzac biscuits for the occasion. These biscuits date back to the days of the War. They were made by wives and mothers and sent to the soldiers. They had a long shelf life so that they could withstand the long naval journey. I have bought them from the supermarket on a few occasions, but this is the first time I've made them myself. Being a long weekend, even if you haven't made these cookies yet, I urge you to try them out tomorrow. They are quick to whip up and would make a nice little project where the kids can help out too. From start to finish these take about half an hour to make. But let me take a moment to tell you how good these biscuits are. Needless to say, these are so much better than the store bought ones. The flavour is unbelievable. And what I love is that these biscuits are both, crunchy and a little chewy at the same time - that is my favourite kind. I used a recipe, I got in a local pamphlet that had been dropped in my mailbox. It is a recipe I am very happy to keep using. 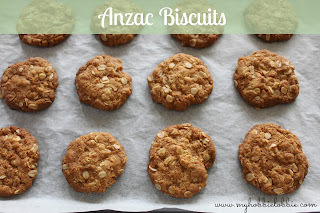 So without any further rambling from me, I present to you, the delicious Anzac bisuit. Line a couple of baking trays with some baking paper. Melt the butter and golden syrup in a saucepan. In a bowl, combine the oats, sugar, coconut and flour and stir well. In a little bowl, combine the baking soda and boiling water and stir well. Add the baking soda solution to the melted butter. Stir through and add this mix to the bowl of dry ingredients. Shape into little balls the size of walnuts and flatten slightly and place well spaced on the lined baking tray. Cool on the tray itself. The biscuits come out still soft and will harden as they cool. When they've completely cooled, store in an airtight container.